Gruul – Wild Anarchists who smash! 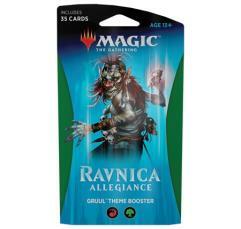 Enhance your Gruul deck with 35 cards from Ravnica Allegiance, including at least one rare or mythic rare card. Add 25 Lands to start building a 60-card deck. Due to Wizards of the Coast policy we cannot ship sealed Magic internationally.